The Ikat print is very well done. I wish the fabric was a thicker weight.Nice buttons. INK+IVY's Orissa Cotton Duvet Cover Set introduces a bold mid-century update to your bedroom decor. 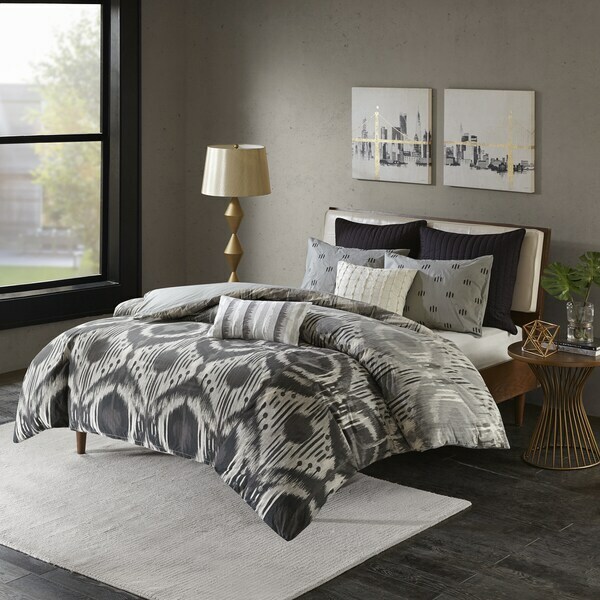 Made from 100-percent cotton, the duvet cover flaunts an ombre Ikat print, in rich shades of grey, with a solid grey reverse that complements the striking design seen on top of the bed. A button closure and four inside corner ties allow you to place and secure a comforter insert within the duvet cover, for warmth and comfort. Two cotton shams feature a black abstract design on the grey fabric that adds a charming touch to the bedding set. Machine washable for easy care, this cotton duvet cover mini set provides the perfect blend of eye-catching style and superior comfort to revitalize your bedroom. This is well made (especially for the price) and the pattern is beautiful and fun. It's lighter at the top and gradually gets darker towards the bottom, which I think is super cool. The shams aren't fancy. Basically, just a pillowcase that opens in the back with a cool embroidered pattern. I accidentally ordered the Full/Queen instead of the King/Cailifornia King, so I'm interested to see if it provides good coverage of the bed in the correct size. This is so often a problem, but if the measurements are true to the size listed it should be perfect! Cool design but not very soft and looks “dirty” with my white bed and dresser. Super disappointed! Will pair nicely with green walls and black and white modern artwork! So pretty, can't wait to get it!